Recently, however, he returned to his studio and painted a new series of these works on illustration board, creating a complete collection unlike his familiar mixed media style. These combinations of silkscreen prints and acrylic paint, all from 2011, are smaller in scale, at 20x24 inches. Because they are on board rather than paper, the pieces frame well without glass. As a result, the texture and effect of these works closely resembles a painting on canvas. Although combinations of paint and print, each of these mixed medias is one-of-a-kind, completely unique in its final form. George repeats themes of flowers, hearts, hurricanes, and oak trees, combined with the Blue Dog in colorful compositions. These new works exhibit a significant amount of depth and detail, unusual within George’s large-scale mixed medias on paper. In both cases, however, his love of color and whimsy belie his serious approach. 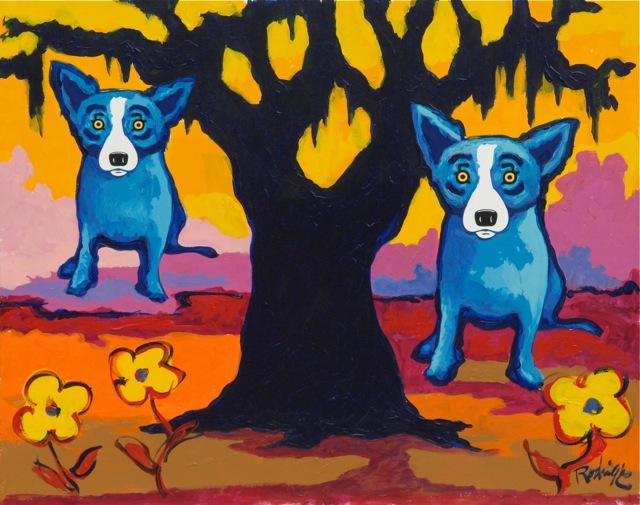 In at least one case, a ghostly dog appears barely visible within the trunk of a typical Rodrigue oak tree. Painted with the New Orleans Jazz and Heritage Festival in mind, George finished the last of these works this past weekend. 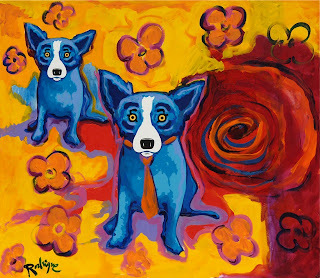 They’ll be framed and hanging in the new location of his New Orleans Gallery in time for Jazz Fest, mid-April. His new works are fantastic! I hope I get a chance to go to the Gallery and see them "first hand". OMG OMG OMG!!!!! I LOVE this artwork!!!! 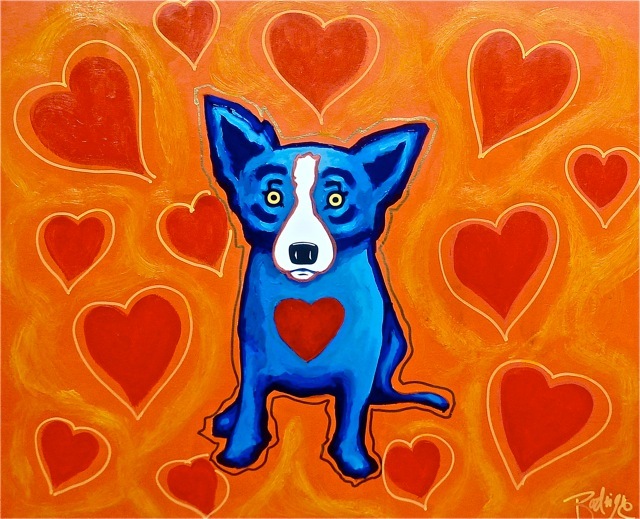 I'd like to purchase, for want of a title, "My Heart Belongs to You"--just need more info--size, price, framing, etc. I have a painting of George's purchased from the NO gallery in the early 90's when Judith Proctor (a dear friend) worked there. I named it "Even Good Dogs Get the Blues". It has a place of honor in our home. 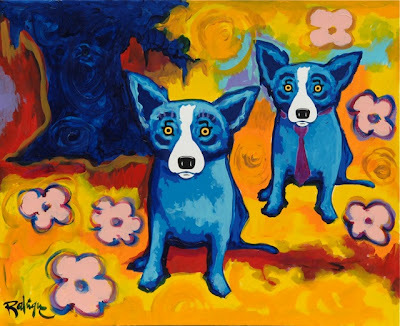 I think this new work would be good company for the 3 "Blue Dogs" in my painting! 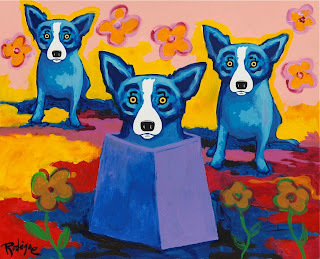 Hi Pat - Thanks so much for writing in and for your continuing interest in George's paintings. Unfortunately most of the works in this particular post are now sold; however, with some good news, George finished several new mixed medias in this style in the last few months. Thank you also for mentioning Judith. We've missed her for years around here, and should she ever decide to come back to New Orleans, well, that would be a happy day. Please give her my regards if you see her soon.